What do you hope to change in 2019? If your New Year’s resolutions have already gotten off track, don’t feel bad. 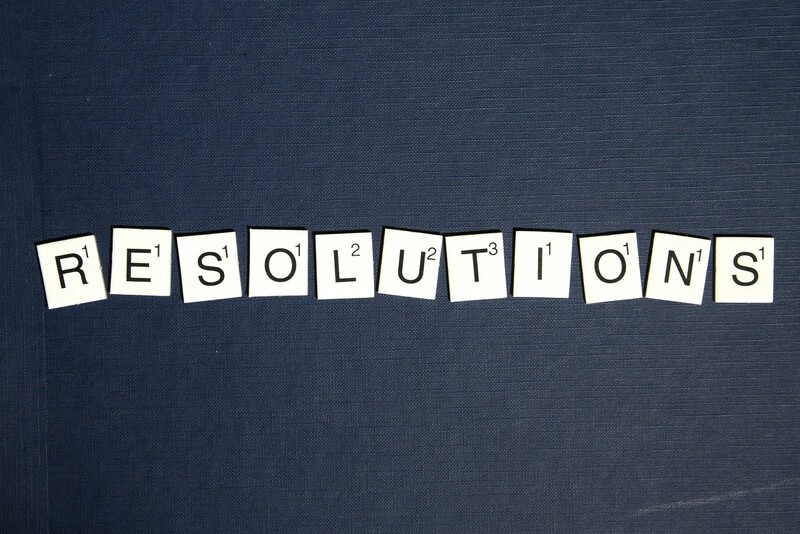 Various studies estimate that 80 to 90 percent of resolutions fail. We can get our resolutions back on track — we can build motivation and increase our chances for success by continually reminding ourselves why change is important to us. The same is true with professional or organizational goals. In my career, I’ve been what some might call a “change agent,” working as an employee or serving as a consultant to organizations that say they want to change. Effecting change is often easier said than done, as some experts suggest that about 70% of large-scale change initiatives fail to meet expectations in various workplaces (although some question that estimate). Similar to our personal resolutions, these organizations often spend too much time talking about needs to change, instead of focusing more on . organizations are complicated, and so are individuals. Having enough desire to say “I need to change” or “I want to change” is just the starting point. We have to keep reminding ourselves why change is important in order to continually talk ourselves into taking action and sustaining change. Change is an ongoing process, not a one-time event. Far too often, people or organizations end up, essentially, talking themselves out of change. We have reasons to change, but we also have reasons to maintain the status quo. We’re “on the fence” or “stuck,” which means positive and self-motivated changes often don’t hold. Someone want to eat better, but a daily habit of ice cream after dinner sure seems to help after a stressful day. One of the core lessons of Motivational Interviewing is that it’s normal and quite natural for people to be stuck in a state of ambivalence, even when faced with the idea of a positive change that we initiate (as opposed to being forced on us). We should expect ambivalence and shouldn’t beat ourselves up over it. We have some desire for change, but we also have reasons not to change. Again, this is normal, but we can work through it. The practice of Motivational Interviewing shows us that the greatest predictor of taking action and sustaining that change is when change talk outweighs sustain talk. While this approach comes from the realm of counseling, the method is very useful in strengthening one’s motivation in the workplace or in our personal lives. When I feel stuck, one lesson I’ve adopted from Motivational Interviewing is to actually write out as many change talk statements as I can. That’s something that can be posted on my bathroom mirror, desk, or wherever I’m likely to be reminded of it. Some suggest saying the reasons out loud is even more powerful. Another thing that’s helpful is to be more mindful of sustain talk in your words or your inner monologue. Again, don’t blame yourself when it happens, but recognize it and try to think (or better yet speak) some change talk. Don’t just remind yourself what you’re trying to change — remind yourself of the reasons why. When I was in the process of writing my latest book, Measures of Success: React Less, Lead Better, Improve More, I was quite often stuck in that state of ambivalence. Of course, the book was something I wanted to write. I was expressing both “change talk” and “sustain talk” at various times, a classic sign of ambivalence. Whenever I recognized sustain talk (being too busy, worrying if anybody would actually buy it), I tried replacing with change talk. 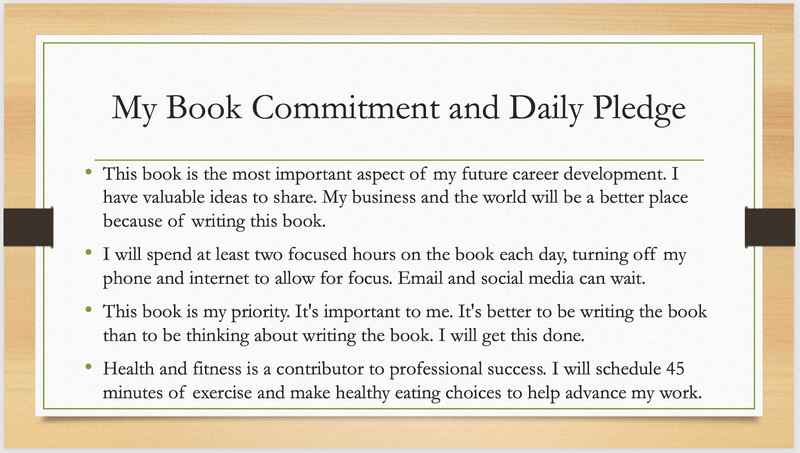 Instead of just focusing on “I want to write a book,” I kept the written why statements in front of me, such as “Finishing this book will be an important contributor to my own success over the next few years.” Below is the result of a similar process that my book coach, Cathy Fyock, had suggested. Looking at this made me think more about the “why” than the “what” of writing. If you’re struggling to come up with change talk statements, there are two questions that you can ask yourself from the Motivational Interviewing playbook. First, ask, “How motivated are you to make this change?” on a scale of 1 to 10, with 1 being not at all motivated and 10 being completely motivated. Let’s say you answered “5.” The important follow-up question is, “Why did you say 5 instead of 1?” Your answer to this question draws out desires, reasons, and needs. Another question you can ask is, “How confident are you in making this change?” with the same 1 to 10 scale and the same follow up question. These methods, applied to your own New Year’s resolutions or other professional goals, will help turn a desire or a wish into commitment, action, and sustainment. The way we’ve typically done resolutions in the past doesn’t work; thankfully, Motivational Interviewing shows us a better way. If you’d like to learn more about Motivational Interviewing, I’ve compiled a page with a number of links and resources. I also elaborate a bit more in this blog post. Mark Graban is a consultant, author, and speaker. Mark is the author of the Shingo Award-winning books Lean Hospitals and Healthcare Kaizen. Mark is also the editor of the anthology Practicing Lean. Has recently published his latest book, Measures of Success: React Less, Lead Better, Improve More. He is also a Senior Advisor to the technology company and is a board member of the Louise M. Batz Patient Safety Foundation. Mark blogs most days at www.LeanBlog.org and has produced over 550 podcast episodes.